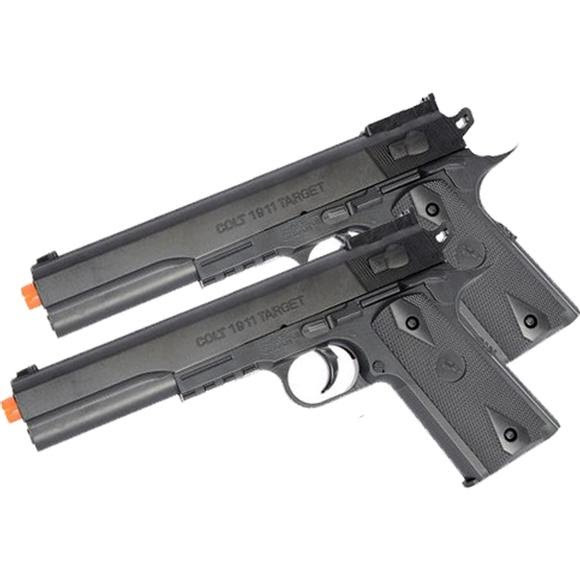 The Palco Colt 1911 Two Player Airsoft Buddy Pack features two 1911 spring powered pistols, two pairs of full eye protection, and two 500 count ammo packs. Now you and a friend are ready for combat. Spring-powered Airsoft guns use energy in a compressed spring to "fire" an Airsoft pellet down the barrel of the gun. Because the spring must be re-compressed before each shot (achieved by "cocking" the gun), spring-powered Airsoft guns are limited to a single shot, and are therefore incapable of semi or full automatic modes of fire. Typically, spring-powered guns are not as powerful as gas, CO2, and electric guns.